The young king of modern piano does Godfather Bill Evans proud once again with another winning live album at the “Carnegie Hall of jazz". As any jazz fan is aware of, there is nary a better place to cut a live album than the fabled Village Vanguard in New York’s Greenwich Village district. As those who’ve been lucky enough to have caught a show there are well aware of, this legendary venue, which first opened in 1935 and has hosted just about every great name in the book, is a picture-perfect image of what one may have in their heads of what a quintessential jazz club looks like: small, dark, and smoky, flanked by a neon-tubing sign hanging above the entryway canopy and tiny stage that sits before a smattering of cocktail tables that seat only 123 people, all of whom are strictly enforced to adhere to the club’s “no talking” policy during sets. And if you consider Thelonious Monk to be Moses, Miles Davis Mohammed and John Coltrane, whose immortal appearances at the Vanguard in 1961 and 1966 have yielded two of his most essential live recordings, as Jesus, that quote is pure gospel. But when you talk of the great albums that have emerged from the legendary venue located at 178 7th Ave South in one of the last triangular buildings left in the city, there isn’t a jazz critic worth his word in salt who would fail to mention Bill Evans’ Sunday At The Village Vanguard in the top three of their list, or the late Mr. Evans’ Complete 1961 Village Vanguard Recordings, the lovingly repackaged box set reissued in 2003 by Riverside, for that matter. There’s something about the sound of piano trio in that room that inspires monumental performance. And perhaps no other jazz pianist since Evans performed his final marathon four-night run at the Vanguard in June of 1980 shortly before his untimely death understands that concept quite like Brad Mehldau. Since breaking out as one of jazz’s most promising young white lions in the early '90s, Mehldau has already recorded two live albums at the Vanguard as part of his acclaimed Art of the Trio series. 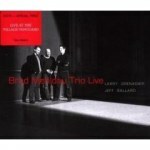 On Brad Mehldau Trio Live, he provides yet another impressive showcase from his favorite NYC stage across a massive two-disc set that features his latest trio, which includes longtime bassist Larry Grenadier and daring new drummer Jeff Ballard. Recorded and compiled from a six night residency in October of 2006, Live is classic Mehldau through and through. Similar to his previous two albums from the Vanguard, this one is a well-hued balance between original and cover material. But where he previously stayed within the safety zone of tackling jazz standards in the past (with the one exception of his gorgeous rendition of Radiohead’s “Exit Music (For A Film)” from 1999’s Art of the Trio Vol. 4: Back at the Vanguard), Mehldau decidedly utilized his status as a veteran of the VV stage to make bolder choices in the tunes he tackled during this particular October run. He still pays his dues to the jazz gods here, tastefully strolling through Ray Noble’s ballroom standard “The Very Thought of You” on the first CD before busting out fierce rearrangements of Jimmy Heath’s “C.T.A.” and a 15-minute rip through John Coltrane’s two-minute Giant Steps gem “Countdown” on disc two. But its when Mehldau does what’s earned him a loyal following amongst the new generation of jazz aficionados, rearranging nuggets from our alt-rock youth in a post-bop motif, does Live earn its bragging rights as the piano man’s strongest Village Vanguard album to date. Here, he leads Grenadier and Ballard through a soulful, Evans-esque rewiring of Oasis’ “Wonderwall” and then transforms Soundgarden’s Superunknown ballad “Black Hole Sun” into a Cecil Taylor-like freeform frenzy. And it’s in those moments where Mehldau earns his most rightful place on the stage of the last great American jazz club.